This review is long overdue. I received these grips from All-City in January 2010. I often review something once it has served its purpose and has been completely used up/annihilated. With these grips, this wasn’t the case. I ended up cutting them off when I decided to strip down my MTB and clean every bolt/bearing/etc. This was in May 2012. 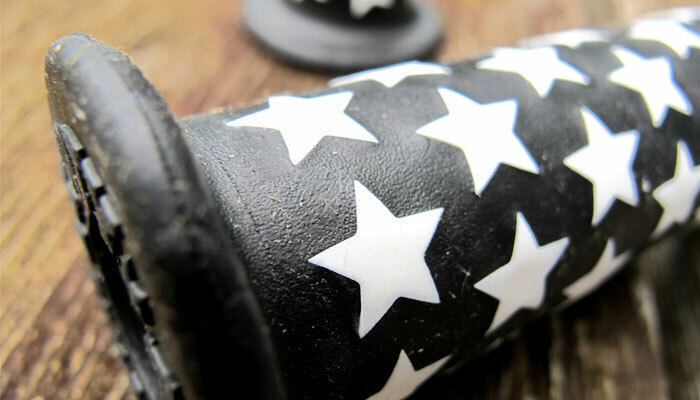 The grips are a dual durometer, with the white stars being a tougher rubber than the black. The black rubber is pretty gummy and kept its grip their entire lifetime. Roughly 18 months into using them, the soft durometer (black) rubber started edging away from the tougher inner rubber (white). This was a visible issue, but not a functional issue at all. The grips were also very easy to clean up. I often would get them filthy looking after four or five rides, but a touch of water and soap on a rag would clean them off in less than 30 seconds. The little stars were still very white the day I cut them off. Since these were a set of “BMX” grips, the donut flanges at the end were pretty big, but not enough to be in the way of my brakes. These grips are pretty flashy and a cheap piece of bling to put on your bike. Even the bar-end side of them were in great condition when I removed them. You know how often during crashes or overall neglect for the bar ends result in a smushed or crappy looking edge? Not these guys. They last forever, and are as comfy as grips get. These would have gotten a perfect score if they would have come in a colorway that fit my bike better. YMMV. ***FCC Mandatory Warning – I did receive these for a discounted price, please be aware that I am showing no bias for them, regardless of the costs or benefits.